“The last day of Kaile’s life did not start well. She was up before the sun bothered to be, and fumbled a bit with her beside lantern. The flint sparked, the wick caught, and she blinked herself awake in the sudden, violent light. Then she wound up the case and watched it turn. On Inspection Day at her mother’s bakery everything had to go perfectly. So when Snotfish’s whistle ends up in the fire and Kaile allows for goblins to play in the public room not realising the Guard hasn’t been yet, things are far from perfect. The goblins are kicked out and start to curse the bakery and all inside it, but Kaile has a plan and stops the curse from happening. The goblin in charge hands her a bone flute and, desperate to be a musician, Kaile plays it… kicking off the beginning of her end. Her shadow disconnects from her body and everyone believes her to be one of the unquiet dead. No one will look at her, no one will talk to her and the great flood is coming. What a fun story, actually I lie; it was a terrifying story but a great read! 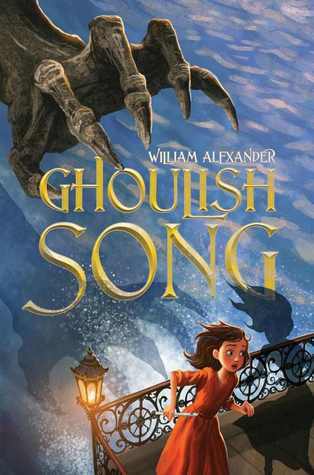 This is the second book from William Alexander which is part of the Zombay series but it doesn’t follow on from Goblin Secrets, which I read last year and you can see my review of here. I think I liked it a lot more that Goblin Secrets and as a smaller book with a less complex narrative it was a lot easier to read. The story is as above, Kaile is separated from her shadow so her family and their friends believe her to be dead. She knows the flute is the cause so her and her shadow take off to find out why and what they can do about it. At the same time there are rumours that the great flood which has been predicted for years, is on its way very soon and Kaile meets a musician who believes she can help the musicians save Zombay. I loved the story from start to finish and I think it was a great yet terrifying adventure that Kaile goes on, which is such to be loved by many readers in the 9-12 range. I thought that the writing is a lot more accessible than in the previous book and that it flowed a lot better, with things making a lot more sense. I loved the characters we meet and that Vass turns up just for a little while. There were less characters (that I can remember) in it from the first book than I thought there would be but I think I preferred that as the first book didn’t grab me as much as I had hoped it would. All in all Ghoulish Song was exciting and full of adventure, there were scary its and funny bits and I really loved Shade’s voice and how she stood out as a character in herself, despite who she was. I think Ava was an interesting character too, one who’s responsibilities had make her grow up a bit too fast I think, but she’s still a kid at heart and thats what set off the events of the book. I would have liked to know how old Kaile was, as its never explicitly said and I saw her as about 12/13 but I do kinda want to know! I think if you have a younger reader who loves fantasy and adventure they are going to love this book a lot so I would recommend it, also there is no need to have read the first Zombay book before it, in fact I would be tempted to say read it after as this is a better introduction to the world of Zombay that Goblin Secrets was. Ghoulish Song was published on November 7th 2013 by Much-In-Little. My copy was sent to me from the publisher in exchange for an honest review. I’m sure you are doing absolutely wonderfully Raimy! I have all this to come but I’m thankful my friends are brutally honest!